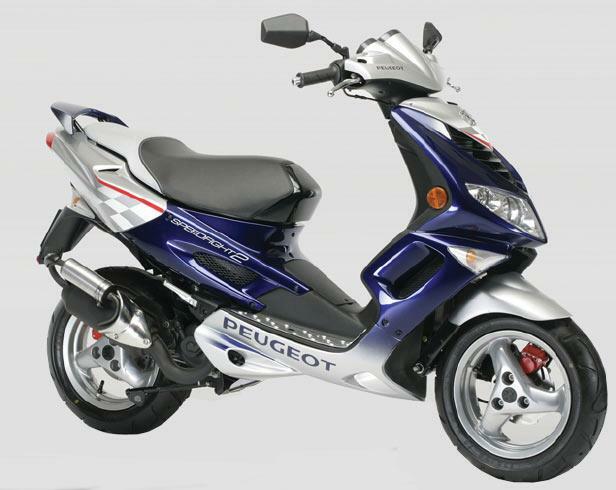 When it comes to scooters, there’s none more iconic and successful than the Peugeot Speedfight. The French runabout has been around for an impressive 12 years selling a staggering half a million units around the world during that time. For 2009 Peugeot redesigned it from the ground up, bringing it firmly into the 21st century. The all-new Speedfight 3 features fully-revised chassis and ergonomics and a choice of two different engines/specs. Chassis-wise, the biggest change with the new Peugeot Speedfight3 50 is the switch to 34mm telescopic forks, which replace the old trademark, single-sided swinging arm. In addition the new versions has 13-inch wheels in place of the old bike’s 12s, to improve stability. The redesign has also added a whopping 120mm to the overall length of the Peugeot Speedfight3, plus 30mm to the wheelbase, altered the floorboards and resculpted the legshields. Overall, the changes are welcome. The bigger wheels make it feel more planted, the new forks are an instant improvement over the old awkward and heavy single sided front arm and the new, radially-mounted front brake is stonking. For the Peugeot Speedfight3 50, two new engines are available – either air or liquid-cooled. Both are Euro 3 compliant two-strokes and both feel fairly nippy, although we preferred the liquid-cooled version. It sounded as sweet as a nut and would produce another 500rpm over its air-cooled stable mate – essential extra power on a 50! 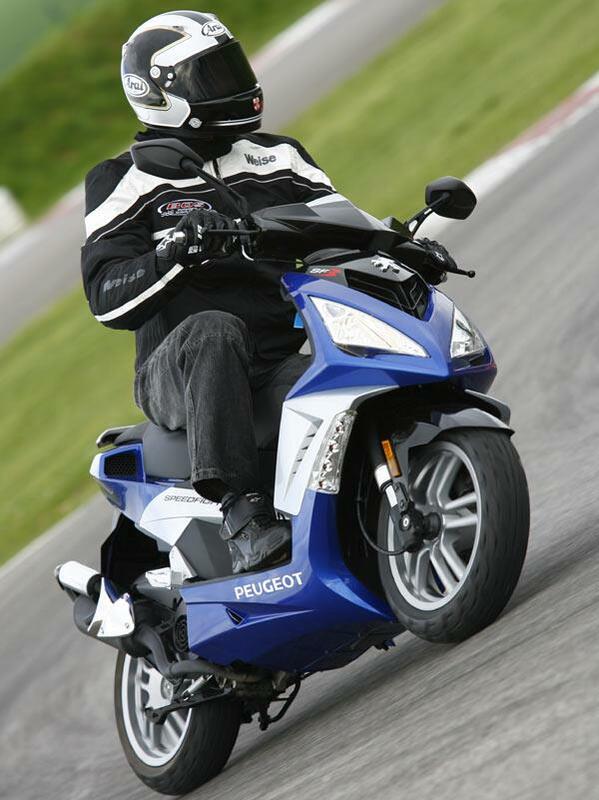 Peugeot quality and reliability has always been among the best in the scooter class and the new Speedfight3 maintains that tradition. They’re generally robust, refined, and well built. Peugeots have always happily occupied the upper middle-ground, offering quality machine with decent spec at reasonable prices, and the new Speedfight3 is no different – that’s why they’ve proved so popular. Find a Peugeot Speedfight 50 for sale. Insurance group: 1 of 17 – compare motorcycle insurance quotes now. The new Peugeot Speedffight3’s seat height is unchanged at a comfortable 800mm but the seat has been reshaped and the fuel tank repositioned to lower the centre of gravity and help gain storage space beneath the seat. The result is there’s now enough space to accommodate a full face lid – or the optional Peugeot stereo system which plugs into the 12v socket and includes an iPod dock, sub and amp. The speakers mount into the dummy air intakes on the side of the rear panels. It also has handlebar-mounted controls. Cool or what? Styling-wise Peugeot’s baby still looks like a Speedfight but the panels have been sharpened up, lights and indicators redesigned and the paintjob refreshed. The instruments are all new, too. Compare and buy parts for the Peugeot Speedfight in the MCN Shop. 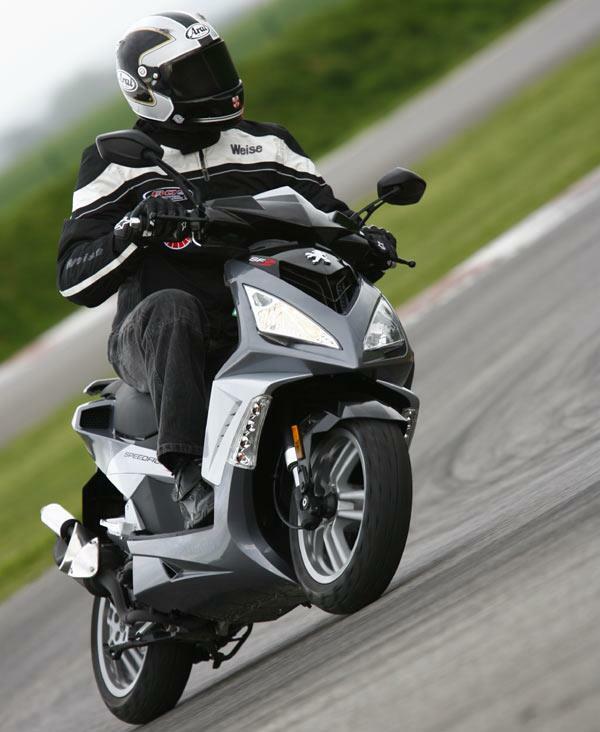 2 owners have reviewed their PEUGEOT SPEEDFIGHT 3 50 (2009-on) and rated it in a number of areas. Read what they have to say and what they like and dislike about the bike below. I brought a brand new Peugeot speedfight 4 Iceblade 2 months ago and i'm already experiencing many issues with the bike. It's a great bike when it's up and running perfectly, but the reliabilty is a real letdown.